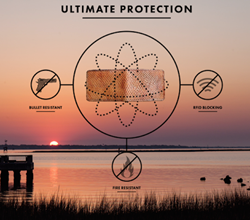 The Southern Trapper, a hand-made leather goods company, announces the launch of its Kickstarter campaign on May 11 2016, to complete the development of its new line of ultra-durable accessories. The company aims to raise $28,000 on the platform to fund the first batch of its innovative new line of impenetrable wallets. With the launch of its new Ultimate line of wallets, The Southern Trapper looks to take its trademark durability to a new level. With a successful Kickstarter campaign, The Southern Trapper anticipates its Ultimate line to be available for purchase online in the third quarter of 2016 with listed price from $250 (pricing and availability subject to change). To learn more or to support the Kickstarter campaign, visit the campaign. For more information on The Southern Trapper, visit http://www.thesoutherntrapper.com/. Established in 2015 in Charleston, SC, The Southern Trapper is a leather works company that works exclusively in the highest-quality exotic leathers sourced from sustainable, domestic hunters and trappers. The Southern Trapper produces heirloom-quality wallets, credit card holders and other everyday leather goods. A portion of all sales from The Southern Trapper benefits at-risk students in the Charleston community.